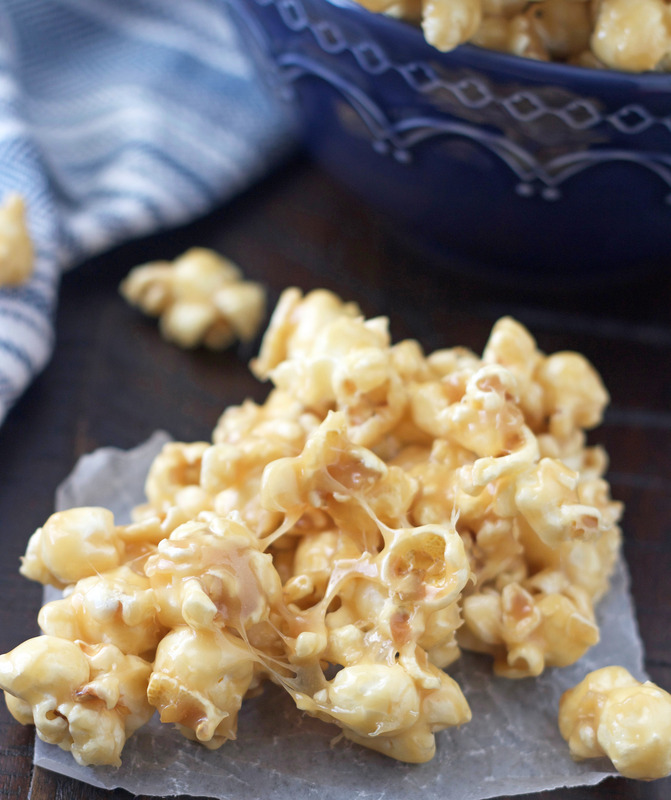 This Caramel Popcorn has been a family favorite since I was a kid. It’s gooey, soft and ridiculously good. It’s super simple to make and is always a great gift to give. I can’t believe we’re on day 11 of this sugar frenzy. Holy cow this one has has flown by. Where have the last 11 days gone? I’ve got nothing done for Christmas, probably because I’ve been up to my eyeballs in sugar (lol! ), so it’s probably a good thing it’s winding down. Well I’ve been blogging for almost five years now and I can’t believe I’ve never shared our family’s favorite caramel corn recipe. I know it’s a pretty standard recipe, and it’s probably the same recipe many of you use, but there is definitely a wrong and right way to make it. Growing up, our Sunday nights almost always consisted of caramel popcorn. My mom would make a batch of caramel corn and all nine of us kids would plop in front of the TV to watch The Wonderful World of Disney (definitely “must-see TV” when I was a kid) along with the big silver bowl of caramel corn. It was my favorite night of the week. I think all my siblings would say the same thing. Oh those were the good old days. There’s really nothing fancy or special about this recipe, but it’s good, really, really good. Still to this day, every time I eat it, it brings back a flood of great memories. The secret to making this is to not overcook your caramel. Take it off the stove as soon as it gets to softball stage, and you want it to be a “soft” softball stage (see recipe notes). Also, you don’t want to use too much popcorn. We like our popcorn to be really gooey, so I use less popcorn than probably some people. This stuff is so crazy delicious a bag of it makes a killer neighbor gift. Pop popcorn using a hot air popper or other any popcorn machine you have. Place popped popcorn in a large bowl, removing any kernals. Set bowl aside. In a large saucepan, combine all the ingredients and cook over low heat, stirring constantly until sugar is dissolved. Increase the heat to medium and bring to a boil, stirring constantly. Cook until a softball stage (don't overcook!) then remove from heat and pour over popped popcorn. Carefully stir until all the popcorn is covered. Let cool slightly before eating. You can use microwave popcorn if you want. You'll need about 2 1/2 to 3 bags, depending on how well it pops up. When I do use microwave popcorn I usually use the light, so there's not a lot of salt and butter on it. 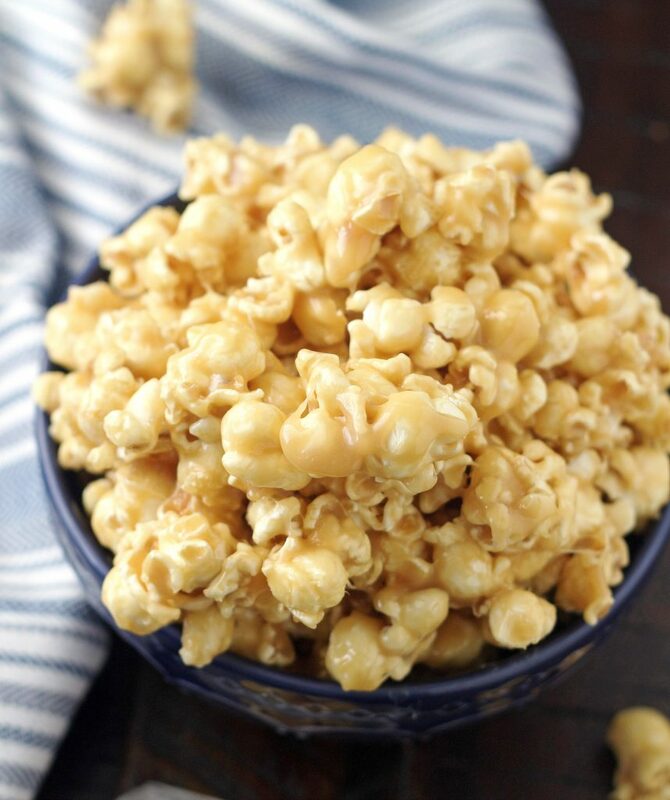 I have used the movie theater butter kind before and it's delicious with the caramel sauce poured over it, it's just a little richer tasting with the buttered popcorn. I use the cold water test to check for the softball stage. I take it off the stove as soon as it forms a really soft ball, I don't let it get to a firm softball because I like my popcorn to stay soft and gooey. Once it comes to a full boil, it only takes 4 to 5 minutes to get it to the right softball stage. 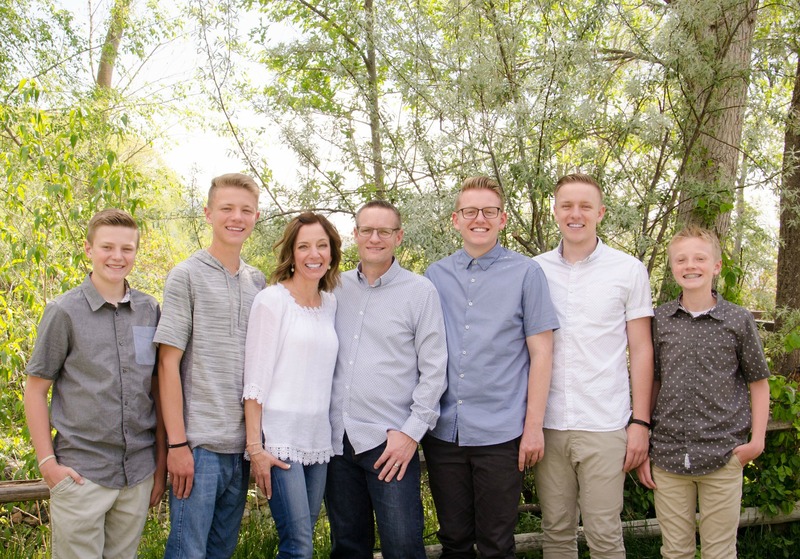 This is a family keeper for sure!